A new product such as Airwheel electric unicycle, from born to popularity, it takes time and process, in the near future, Airwheel electric balancing scooter will become popular products from minority to public. Airway electric unicycle, also called electric balancing scooter, segway etc, is a new and portable device. When people mentioned the portable device or wearable device, all the people will think these products with lot of intelligent elements. Why we said the purpose of unicycle is popular? Because it has fully reached the urban travel demand of using electric. Airwheel electric one wheel scooter (http://www.airwheel.cn/) using imported Sony lithium-ion battery, it is stable performance and stronger power, stable performance, stronger in power, zero emission, without air polluted. In addition, electric scooter smaller size, nearly can go through every space, consequently, the problem of long term perplex to the people of driving car as well the traffic congestion and jams will be stopped. Currently, the people of use Airwheel electric balancing have not become the trend for population, although Airwheel have an completed agent system in China, with receiving huge sale quantity, however, compare the popularity of China, the sale quantity of unicycle are still lower ,temporally is still by minority consume, in addition , the entire electric unicycle did not carry on the wide range promotion on the industry, which is the reason why the products didn’t familiarity by majority people. Although the electric unicycle is on stage of “minority”. But it doesn’t means future will be same, from the use of electric unicycle of view, it's a lot of traffic than the existing tools which is all public, For reasons we known, the current major cities in the emissions of air pollution have become the main reason. How to reduce? Currently the means adopted are: limit line, restricting the car on road by the car number, limiting the road range, and advocating lower output volume, hybrid, such as the use of electricity or gas. But we must see that these methods are either in conflict with people's travel needs, either technical or related conditions are not mutual. 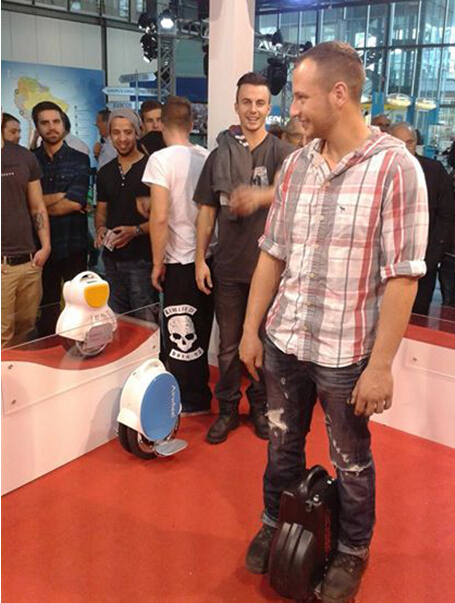 Why we said the usage of electric unicycle is “popular”? Because it has fully reached the travel needs from the electric need. Airwheel electric unicycle using the imported Sony Li-ion battery, it is stable performance, high power, the advantage is no end gas discharge, no air polluted. In addition, the electric unicycle small size, almost can move through everywhere, so the problem of traffic jam and road congestions perplex the car driving people will be stopped. The meaning of electric unicycle are very “popularity”—the energy exhausted is problem of all human being faced, environment protection is common theme of people, although the majority of unicycle using people are office worker, teen-agers, fashion snappy dressers. But we all need see the products from established to popularity will need a process. From the developing tread expressed, this process are very smoothly, which is not hard to predicted, in the near future, the electric unicycle are will from the small minority to big majority, and become the daily walking replacing device of commuter.